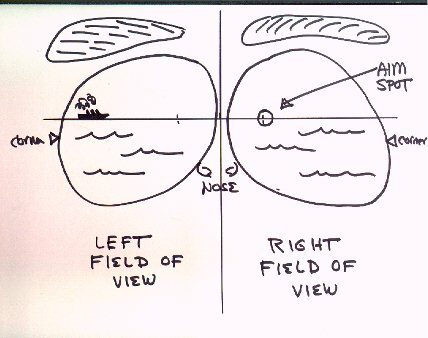 The shape and geometrical features of your field of vision offers assistance to your putting targeting and stroke that you may not be aware of -- and learning these matters. Your eye fields are two egg-shaped regions that overlap. If you close your non-dominant eye, you can see the shape defined by the inside of your nose, your eyebrow, the corner of your eye, and your cheek. With a straight-ahead gaze, there is one and only one point where your line of sight penetrates this egg-shape -- about 1" in from the bridge of your nose where your pupil is located and is pointed. If you wore glasses, you could paint a red dot with a marker on the lens where this spot is, and everytime your gaze is straight out you would look thru this spot. Any other gaze direction does not. A horizontal line across both pupils plus this aim spot define the plane of your vision with this gaze. 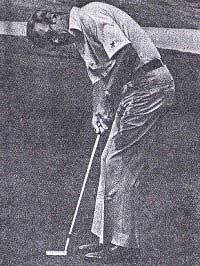 When you place this gaze directly above the ball, the vertical plane of the putt and this plane of vision coincide. This "line" across both pupils then corresponds exactly with the startline of your square putt on the ground, as well as the line your stroke needs to follow to move the sweetspot back and thru the ball. So what? This means that your ball must start on this line, and you can reference the startline by paying attention to your egg-shaped fields of vision. The line in your rearward eye's field sends the ball out into the bridge of your nose. 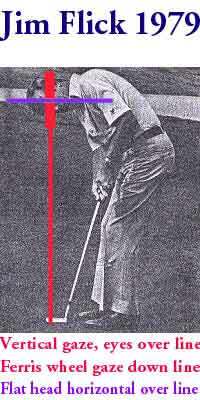 The line in the forward eye's field sends the ball out into the corner of your eye. This is a lot like cheating! Try putting with glasses (or sunglasses). Note the aim spot for a straight-ahead gaze in your dominant eye. Position your dominant-eye's glasses lens over the ball so the straight-ahead plane of vision matches the vertical plane of the putt. You can then notice that the top of the glasses frame parallels your startline and that a line from one corner of the frame to the other crosses your pupils and runs right on top of the startline on the ground. You will also be able to notice the nosepiece for the glasses and see the startline of the putt in your rearward eye, and notice the corner of the forward lens and see how the startline sends the ball out to the corner of the glasses. There is much more that can be done with glasses, both as a training aid and as a way to putt -- especially in turning the head and gaze toward the target. If you envision both fields of vision as the gondolas on a Ferris Wheel, with your neck as the axis, then you turn your head targetward to deliver the two gondolas of your gaze to the target, with one eye vertically above the other. From the target looking back, your glasses top frame line will appear vertical. (See Jim Flick's glasses, below.) Give it a try and work out the details for yourself. I think it ought to really help!